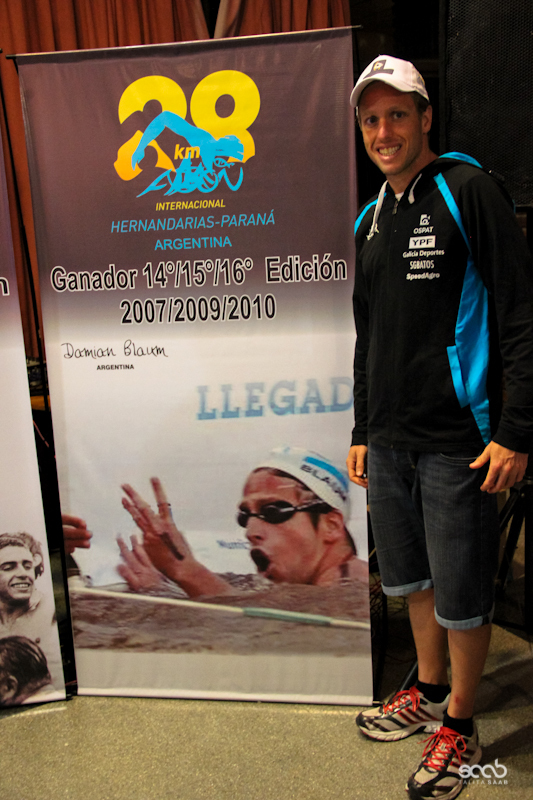 The FINA 2013 Open Water Swimming Grand Prix started with the three classic Argentinian races. 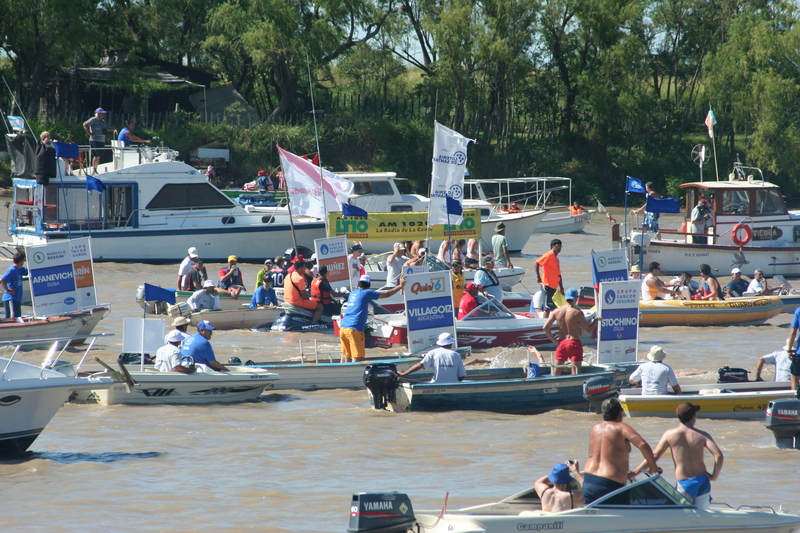 The circuit begins with a 15 km race in a buoyed circuit in Rosario City (the city of Che), swimming along the popular city beaches filled with people cheering on the swimmers. 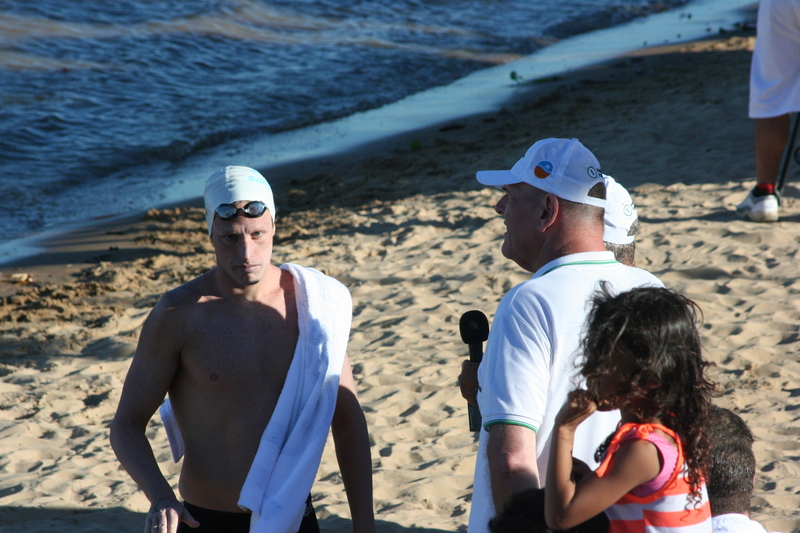 The Italian Simone Ercoli, a specialist in shorter open water distances, won the men’s race. I finished about 11 seconds behind the winner, in a very tough race. Basically the finish feels like a lottery: you need to fight with all that you’ve got in order to get a better position at the finish. I was happy with my 6th place in this first race but even happier a few minutes later when my wife, Esther Nunez, won the women’s race! A week later was the second event: the legendary Santa Fe Coronda– 57 km. I finished in 3rd place in 8 hours 22 minutes, only 15 seconds slower than the winner Simone Ercoli. I was happy with this outcome especially since Santa Fe Coronda race is one of the most strategic in the GP circuit, and being on the podium is always valuable. This race is unique in that it is the sporting event (after the World Rally Championship in Argentina), with the largest number of spectators in Argentina. There are over 150,000 people watching the race from boats or from any other floating device in order to be near the swimmers, and thousands of people at the thrilling finish in Coronda (the capital of the strawberry). In women, the Russian Olga Kozydub won the race and Esther came in a valuable 3rd place in 8 hours 40 minutes. A week later came the Hernandarias – Paraná 88 km race. The recovery after Santa Fe Coronda was very traumatic for me. Added to the physical weardown, I spent a few days after the race with gastroenteritis, serum and dehydration as a result of the poor state of the river water. In no moment did I lose my confidence that I would get through this, but I had the logical fears of wondering up to what limit I could push my body. When I talked to my coach, Fred Vergnoux, he told me not to think of my stomach and just enjoy the race, so that’s what I tried to do. I swam and enjoyed it, and as the hours passed, I felt increasingly better and confident about winning the world’s longest swim race for the 4th time. The problems, however, came in the last 3 hours of the race. I asked Luciano Sales Rubio to help out by swimming ahead of me because I was always swimming in front. He said that he could not because he was exhausted, so I continued onward, swimming ahead, working hard and with just one objective in my mind: to win. After dragging on my heels for 3 hours, Luciano Sales Rubio was more rested, as it happens in other sports such as cycling or running, where the one who is benefits and gets to make less of an effort. We both finished at 9 hours 39 minutes 42 seconds but Luciano won by hundredths of a second. Being so close and after such an effort it was tough to lose. But it does no good to look back….I have my head high, looking onward and thinking about my 2013 objective. In women, the Argentinian Pilar Geijo won the race and Esther finished 3rd in a very strong race. It has been a positive start, the game is still open and the championship will be exciting. A big salute to all, and we will be in touch!! Question: After the Gibraltar, are you going to continue this blog?